Unlike a woman’s eggs, which we are born with: sperm are constantly made in a cycle which takes about 80 days. That’s good news because it means the quality of a man’s sperm is constantly shifting and changing and can be improved with good nutrition and other lifestyle changes. How a man eats, exercises, what he wears and how he deals with stress and other life events can negatively, as well as positively, affect his sperm. So if you get feedback from your doctor that your sperm is not so good here’s the good news – you now have 3 months to pull out all the stops and improve the next batch. Ideally, if you can give yourselves 6 months results would be even better. Morphology – shape of the head, tail and body of the sperm cells. How many are malformed and not able to swim or perform well. Motility – how well they move – round in circles, fast, slow etc. If there aren’t enough sperm, or they are not able to propel themselves forward to reach or have the energy to reach and fertilise an egg then pregnancy is unlikely to happen. The lab might flag up a problem with one or more of these factors and they can be improved with nutrition and lifestyle help as well as with medical support. More detailed sperm tests can also check DNA Fragmentation – an extra test you can ask for which checks on the genetic material within the head of the sperm. Men with poor sperm analysis results, and even some men with normal sperm analysis results, can have high levels of DNA fragmentation which can be a cause of male sub fertility, miscarriage and IVF failure. 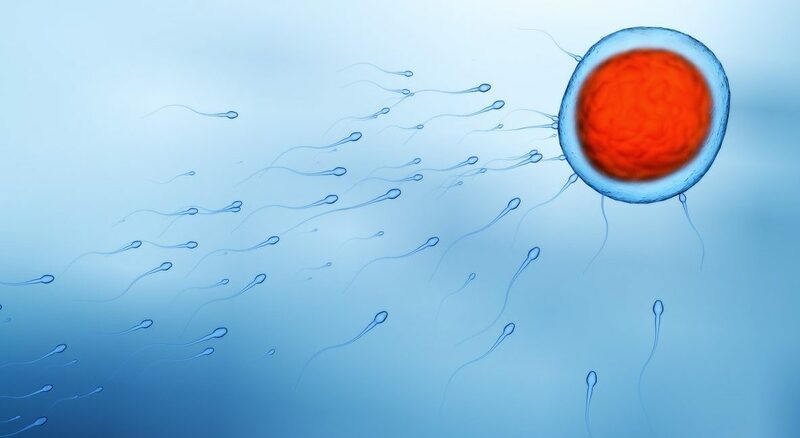 Oxidative damage to sperm can be caused by infection. If you’ve had a virus or bout of flu before you do your sperm test you may need to be retested, as the infection may have affected your result. Or you may have an on-going low grade or local infection which needs medical help and an immune boosting diet. Varicoceles are blockages in the veins of the scrotum which may create localised areas of heat, infection or not let sperm through. They can sometimes be as a result of knocks, old injuries, surgeries or even excessive cycling. Temperature a man’s body works hard to store the sperm on the outside of the body for a reason. It wants to keep it at a temperature lower than normal body temperature. No laptops on knees. Tight underwear or Lycra cycling shorts can damage sperm. Better to wear looser fitting clothes and cotton boxers as often as you can. Just like any cell in the body as we age and the more stressed we are the more likelihood there is of oxidative damage to sperm cells and lower rates of fertilisation. Chemical Exposure jobs which expose men to paint fumes, chemicals, and even childhood or historical exposure to banned substances like DDT and polychlorinated biphenyls (PCB’s) which still linger in soil, water and the environment can still affect sperm. It’s also better for male sperm counts if you reduce exposure to plastics which mimic oestrogens like cling film which leaches into food when heated. Covering warm food in cling film or heating food with cling film on in a microwave should be avoided. Reducing stress learning how to meditate, taking more holidays, leaving work on time, getting plenty of sleep, going to bed earlier, resting and making sure you get help and support from a counsellor or psychotherapist, life coach, a men’s group or open up to friends and family when you have too much on your mind or are feeling low, worried or anxious can make a huge difference to how your body functions. Stress eats up the healthy vitamins, minerals and antioxidants like zinc, selenium, B-vits, Vit C and magnesium your sperm needs to be top notch. Reduce Caffeine – Don’t run out to work with a coffee and no breakfast. Limit caffeine to 1 a day. Have a good protein breakfast like eggs – only takes a couple of minutes to boil a couple of eggs or make a protein smoothie – fruit and a handful of nuts or nut butter for protein or a protein powder. Moderate Exercise – Too little or too much is not good for your sperm. Aim for moderate exercise 3-4 times a week with a couple of rest days thrown in. Vary your exercise – cardio, stretch, and runs, walks, cycles, yoga, pilates. Extreme sport on top of a high stress job might not give you the sperm results you want. But if you rest and nourish yourself you’ll get good sperm results and better work-life balance plus performance. Sleep Hygiene – Limit screen time before bed. Unwind without the stimulation of the blue light and electromagnetic influence of your mobile phone and other devices. Invest in black out blinds. Warm bath, good book and an early night can work wonders. Sleeping lightly, waking and worrying in the middle of the night or waking too early can all make your sperm under par. It’s no surprise that a good balanced high-protein, non-refined meat, fish, pulses, nuts, seeds and a rainbow of fruits, vegetables and good fats from olive oil, coconut oil, organic butter, nuts, seeds and fatty fish give the sperm the amino acids, fatty acids and antioxidants needed for excellent sperm. How to Eat – Don’t skip meals especially breakfast and lunch. Keep them protein rich – eggs, chicken, mackerel, salmon turkey, lamb, beef or pulses and full of good fats – olive oil, coconut and flax oil, nuts and seeds (pumpkin, sesame, sunflower, brazils, walnuts and almonds) for snacks. Have a protein shake if you exercise heavily and when short on time www.motionnutrition.co.uk – organic whey powder is delicious and excellent quality. Sit down and relax when you eat. Don’t eat on the run or at your desk. Eat your main meal before 8pm. Alcohol especially when combined with nicotine is a destructive combination for sperm. If you have drunk and smoked heavily, in the past, even moderately and had a full-on stressful job for several years, you’d be wise to boost your health and recondition your sperm asap. Recreational Drugs – Marijuana slows sperm motility and can affect sperm results. THC, one of the chemicals released from cannabis stop impedes release of enzymes needed for the sperm to get through the female egg’s membrane. Why May Supplements Be Needed? Supplements boost supplies of specific nutrients needed for sperm health. It can be good insurance to make sure you’re not running low on essential vitamins and minerals 3-6 months before you start trying to conceive. Take a good quality male multi-vitamin, a high strength fish oil and probiotics. Many will contain the vitamins and minerals below but it’s vital to get as much as you can from your food. Nutrition and lifestyle impact on the DNA you pass on to your child. Men who work long hours, exercise too hard or too little or who have poor gut health and have not always eaten well, or have smoked or drank hard when younger may need topping up. L-Arginine – reduces the number of abnormal sperm, so improves morphology. Arginine is naturally found in high-protein foods – especially, beef, pork, beef, chicken, tuna, salmon and anchovies. It also helps blood flow and helps maintain erections. L – Carnitine – is used to energise the cell mitochondria, their batteries. It improves count, motility and direction, ability to swim in a straight line. Red meat is rich in Carnitine, as is -fish, chicken, turkey and milk. The body can make L-Carnitine if needed from two sister amini-acids – Lysine and Methionine found in eggs, pulses and grains. Vitamin C – is an antioxidant, which means it helps protect sperm cells from free-radical damage from nicotine, alcohol, sugar, cured meats and ageing. It improves count, motility and morphology and is found in fruit, vegetables and salads especially when eaten raw. Vitamin is lost in cooking or at high temperatures. Have a salad and a smoothie daily and steam rather than boil and fry. Co-Enzyme Q10 – is another protective antioxidant found in shellfish, pork, chicken, beef, sardines, mackerel and some nuts. Vitamin E – is an antioxidant which reduces chromosomal damage and improves its ability to penetrate the egg. Good sources are nuts and seeds (particularly sunflower seeds) and dark green leafy vegetables. Zinc – Is a really important mineral for sperm. It’s got a good track record in improving sperm count. Nuts, seeds, pulses and seafood are excellent sources. Selenium – Another vital antioxidant for male health and sperm, combined with N-acetylcysteine (NAC) it improves sperm motility. Brazil nuts, wholegrain rice an leafy greens have the highest levels. Lycopene – is an antioxidant found in tomatos, red peppers and other red vegatables and fruits. Cooked tomato – homemade tomato paste, passata and tomato soup have higher concentrations than raw sources, especially when combined with a good fat such as olive oil to aid absorption. Lycopene is an essential vitamin for men health, especially prostate health as they age. Glutathione – is the body’s main anti-oxidant. Taking NAC as a supplement increases our body’s naturally made levels. It’s found in asparagus, potatoes, leafy green veg, squash and grapefruit plus other coloured fruit and vegetables. It protects against free-radical sperm damage, protecting sperm morphology and motility. Vitamin D – Ask you GP to test your levels especially during Late Autumn and over the Winter levels can plummet. If you work indoors you could need topping up. Low Vitamin D levels are linked to make infertility. Sunlight and oily fish (mackerel, salmon, sardines, anchovies and herring) are the best sources. Omega 3 Fatty Acids – DHA and EPA are Essential fatty Acids or EFA’s found mostly in oily fish and to a lesser extent in Flax or Linseeds, walnuts and some green vegetables. Whether you have a good result from your sperm test or not or even if you know you both have no fertility issues, preparing for pregnancy and looking after your sperm health is the best insurance you have for giving your child an optimum start in life.